One of the greatest indications that fall is rolling around is when a ton of root vegetables, squashes, and awesome fruit start rolling into your kitchen. I mean, nothing quite beats the smell of roasting some butternut squash in the oven with a dash of cinnamon, cloves, and nutmeg. There’s just something so reassuring and comforting about all fall produce, and I wish it would last throughout the year! 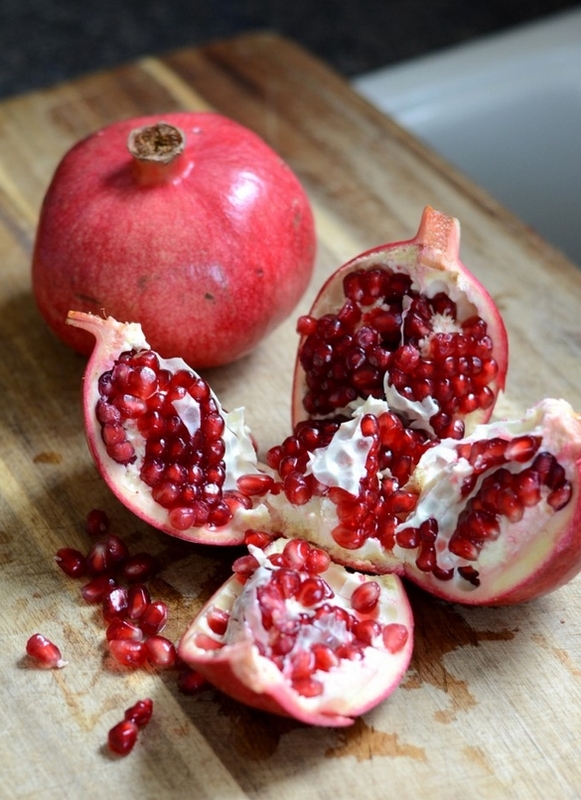 However, I feel as though pomegranates don’t get the attention they deserve! They’re in season from September to about February up here in the Northern Hemisphere, and so many people just disregard them because they don’t know how to open them up. Oh – and no, drinking pomegranate juice cocktails doesn’t count as eating them because that’s just sugar water. 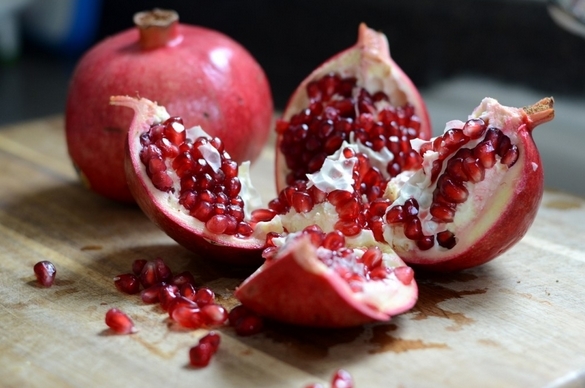 Perhaps they’re much more popular in the UK because you see a lot of middle eastern/Indian influences in their food, and those cultures use tons of pomegranate in their dishes. I mean, I watch endless amounts of Jamie, Nigella, and Gordon, and you always see them use pomegranates in their food. But then you come back over here to North America and people say things like “Oh pomegranate? That’s the stuff Pom is made of right?” and it just makes me roll my eyes to the point where they’re about to pop out of my head. 1. They’ve got tons of B-vitamins, potassium, and folic acid. Especially if you’re vegetarian/vegan, you’re at a higher risk of being deficient in some of your B-vitamins, so eat some more pomegranate! 2. They’re also a great source of non-heme iron, so all you ladies who don’t want to consume endless amounts of meat to meet (that sounds funny) to meet your iron requirements…… here’s another option. Oh, and they’re not bound to (as many?) phytates as iron is in foods like spinach which means better absorption! 4. They’re full of heart-healthy anti-oxidants that have been shown to reduce plaque in your blood vessels, due to their super super high amounts of polyphenols and flavinoids. So basically, they’re great for reducing inflammation and their antioxidant content rivals that of blueberries and cranberries. That being said, I’d stray away from just chugging down a glass of Pom pomegranate juice, even though it’s 100% juice and stuff. Without the fibre in there, the natural sugars in the juice rush into your system and you’ll get sugar rushes and all the crap associated with them. That’s why I’m really not a fan of these juice cleanses or diets. Sugar sugar sugar. Smoothies are slightly better – because you actually keep some fibre in there. But if you were to use some juice in your cooking or smoothies? I’m not against that. and there’s tons of recipes out there if you just Google it! One of my favorite pomegranate things on earth is DAVIDsTEA’s Green Seduction. It’s a green tea with rose-hips and pomegranate arils (seeds), so not only do you get the benefits of pomegranates, but those of green tea and rose-hips as well! It’s organic as well, so give it a try. I loved it iced with some mint stirred in, super refreshing. Well hopefully I’ve convinced you to at least try some pomegranates in your near future, but seriously, it’s some pretty great stuff.